The items below are for sale online by Desert Rivers Audubon or at most of our events and monthly meetings. To purchase online, use the secure shopping cart provided. Thank you for supporting Desert Rivers by purchasing from our “nature store”. Desert Rivers is linked to the Tucson Audubon Online Nature Store as well, in order to provide all sorts of birdwatching and nature related items for sale. Purchasing books, binoculars, and other items helps support both Tucson Audubon, and Desert Rivers Audubon. To enter the Tucson Audubon Online Nature Store please click here. IF YOU ARE A DRAS MEMBER, PLEASE INPUT YOUR MEMBER ID ON THE PAYPAL REVIEW SCREEN BY CLICKING "Add special instructions to merchant". We will review your member status before shipping. Items will be shipped via USPS or UPS Ground within 2 days. Shipping is $3.00 each item for most items. 392 pages. One of the most popular field guides. Kaufman uses photos and detailed info to describe the bird species of North America. full-color illustrations and all-new maps. A leading portable field guide. Covers all of North America with bird illustrations. Considered one of the very best field guides. birders. Also good for kids groups. 528 pages, this field guide covers all the birds of North America with great photos and detailed text on each species. This is one of the best guides available and is highly recommended for birders at all levels. 390 pages. This book has become the bible on children’s environmental education, and expresses Louv’s views, studies, and practical information on children’s need for interaction with nature. A must for educators. 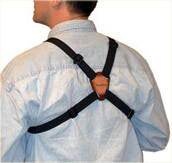 Takes the weight off your neck and puts it on your shoulders for all day comfort. cloth inside a little bag. $18 plus $3 shipping. Comfortable cotton, available in two colors: brown and green with bird design on both. Specify size in order notes.